Nine of Cups Tarot Card Meaning - All Explained HERE! The Nine of Cups is the ninth card in the Cups suit. 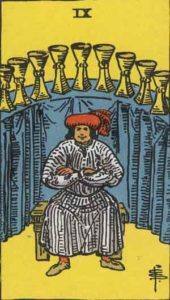 A positive card generally, the illustration shows a character sitting in front of a collection of nine cups, proudly on display. His big grin and folded arms give us a sense of completion; he has achieved. The Nine of Cups represents having your wishes fulfilled and getting what you want, especially in a material sense. Past – The Nine of Cups in the Past position shows a past success; something you’re really proud of. It’s still affecting your life and thoughts. Achievements in life are what we all live for, whether it’s a new job or an exciting holiday or winning at a sport. Don’t stagnate on one thing and be known as the person who did ‘that’, you have to move onto bigger and better things. However, there is no harm in looking back at what you have achieved and knowing that now, you’re able to do much better. Present – The Nine of Cups in the present position means that it’s all going to work out. You might currently be struggling but remember if you don’t give up, you can only succeed. Keep going. You’ll have something to be really proud of. A great card to read if you’re in the middle of a project at work, or an important piece of work at school or college. Future – The Nine of Cups in the future position shows you in the future. You might just be starting off on a project or course of study and having cold feet. Go with it and dedicate yourself. The best advice anybody can give you is to start. Start your project, ambition, hobby. Just begin. There is no reason for anything you make to be good at the start, it is only by constantly working on something that you will improve. Work / Education – The Nine of Cups in regards to work or education means things are finally going to start moving forward for you and you just have to wait for the signal to go. The card shows that you’re on the right path, you’re doing well. As above, keep working on and refining any personal projects you are creating. Making something yourself right now can give you an immense feeling of satisfaction like you have imparted something good on the world. Romance – The Nine of Cups in romance shows now is a good time to meet a prospective partner. Your confidence is going to be high and you’ll have much to talk about. Don’t be overly smug about it. Achievements are good conversation starters but don’t hang on to them for too long. Delve deeper, you could have a relationship to be proud of if you can put the effort in with the right person. Friends – The Nine of Cups in regards to friendship can mean that a small rift will form. Your friends might not feel as close to you, they may even feel uncomfortable around you now because you’ve done something that hasn’t fit into their paradigm of how they perceive you. Remind them, you’re still the same person. Do some of the things you used to do when you were just starting out. Jealousy is one of the worst emotions we can feel, so if you have done something to make your friends jealous, try to tone it down if you’re acting it up. What do you value more, the perception you’re giving off, or the actual achievement? Money – The Nine of Cups in regards to finances is a great sign. The nine of cups is great for material wealth, and you’re going to get it. Don’t expect something like a lottery win, but something longer lasting, a financial achievement you’ll remember for a while. This could be a pay rise, or a new job that pays more. At the very least you won’t be worse off, it’s more likely that some brilliant past idea will come around to pay off in the near future. Health – The Nine of Cups should allay your health worries. If you’re waiting for a test, then it should be good news. Take care not to focus on your body too much and over-think things. You might be proud of how you look and feel, but make sure you aren’t hiding something that could be more serious. Spirituality and Mentality – The Nine of Cups in spirituality reminds you not to focus on the material too much, even if you’ve come into some money or something expensive has entered your life. These things are tools and not objects to be venerated. Focus on your future on the winding path of your life. In reverse, the Nine of Cups can represent the opposite meaning; wishes unfulfilled, a lack of achievement. Try not to let it get you so down, we don’t always get what we want, deserve, or even need. Instead, look to how you can achieve your goals. What steps can you take to get where you want to be? Take care to not overdo things. You want to achieve, but this doesn’t mean you should work all the time. Also, make sure your goals are things you really want to do. This might sound silly, but some of us have goals that exist for the sole reason of pleasing, or putting down others. make your goals about you. What do you want to do? Nine represents completion and resolution. The Nine of Cups in regards to numerology strongly suggests that your goals are going to be attained if you continue on this path, especially if your goals involve completing a collection or finishing the final touch on that project. Many nines in a reading suggest that your current situation is coming to an end, and a new cycle is just around the corner. We’ve selected live tarot readers to give you a FREE 3 Minute interpretation of The Nine of Cups! Scroll through them below and pick your favorite one.